German knives have quite a lengthy history. The brands MetroKitchen has selected, Henckels and Wusthof, have been making beautiful kitchen knives for centuries! Many people like to compare Wusthof vs. Henckels. No matter which you chose you’ll have a superb quality knife that has a lifetime guarantee. Zwilling JA Henckels and Wusthof Trident craft the majority of their knives in Solingen, Germany. 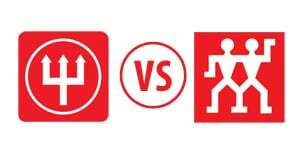 One can only imagine the inter-town rivalry between employees of these two companies! Zwilling JA Henckels began in 1731. Wusthof followed suit in 1814. Both companies were founded before Germany was even a country. At the time of their founding, Solingen was located in the Duchy of Berg. When contrasting and comparing different knife brands, it is essential to compare apples to apples, and in this case, it means comparing forged to forged and stamped to stamped knives. The forged knife styles from JA Henckels are Pro, Pro S, and Four Star. The forged styles made by Wusthof include Wusthof Classic, Wusthof Grand Prix II, Wusthof Classic Ikon. The two main differences between Wusthof vs. Henckels are handles and blades. The knife handle is the most expensive component of a forged knife. Usually, aesthetics and ergonomics drive handle choice. You may select a handle that visually appeals to you while someone else chooses by the grip. Both Wusthof and Henckels make knives with a wide variety of handles, all are top quality. While most of the blades from Henckels and Wusthof look relatively similar to each other, there are some distinctions. First is the hardness of the steel. Henckels has a hardness rating of 56-57 Rockwell, but on some collections designed by Bob Kramer (some are Japanese) is 61 Rockwell. Wusthof is rated at 58 Rockwell. The higher the number, the harder the steel so Wusthof is likely to hold its sharpness longer, while Henckels knives will be a little easier to sharpen. Wusthof sharpens its knives to a narrower 14° angle per side on most standard blades and 10° per side on Asian style blades like Santoku and Nakiri. There are a few other differences in these forged German knives. Henckels International Forged is made in Spain. They’re made with softer steel than other Henckels forged styles that are made in Germany. The Henckels Pro style and the Wusthof Ikon lines (Classic Ikon, Classic Ikon Creme, Ikon Blackwood) have a different blade design. These lines have a “half bolster” design. The bolster is the part of the knife that gets thick just before the blade meets the handle. Most bolsters for German knives look like the one seen here (show image of HK-31021-203). The bolster has a thick area that extends from the top of the blade to the cutting edge. With the Pro, the bolster is abbreviated and only gets thick where the metal meets the handle. The bolster does not extend down to the heel or bottom of the blade. The Wusthof Ikon lines also have the same half bolster design. The reason you’d want this type of knife is, so you have a full blade to use when cutting. In other words, with Wusthof Ikon knives and Henckels Pro knives, you are getting the maximum cutting area from the blade. Both Wusthof and Henckels make stamped knives as well. These are value-priced because they’re cut from a sheet of metal but are still sharp. We have a great article explaining the differences between stamped and forged knives. 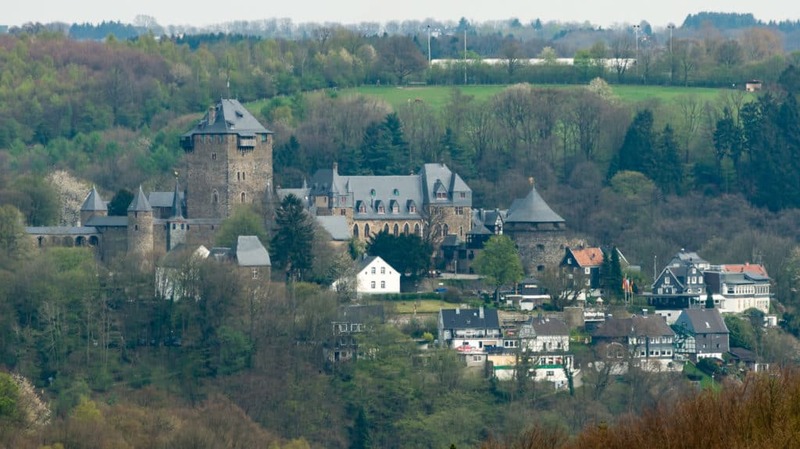 Located in region of Bergisches Land in the western edge of Germany, Solingen is known as the “City of Blades” due to its long storied history of manufacturing blades for swords, knives, scissors and razors dating back to Medieval times. Adding to its legacy as a European smithing town, Solingen has discovered blacksmith smelters dating back 2000 years. 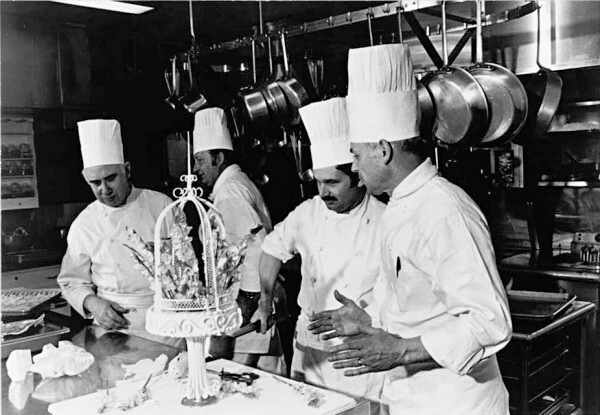 Fun fact: Heinz Bender, who served as head pastry chef and worked for several presidents in the US White House is from Solingen. Whether you buy Henckels or Wusthof, you are purchasing a high-quality German knife that will be super sharp and with a lifetime guarantee. People frequently say, “variety is the spice of life” but there is more than spice to consider when cooking. Choosing the right stainless steel cookware for you is critical. Even when you have decided to go for the name brand and gold standard, All-Clad cookware, there are still others things to consider. 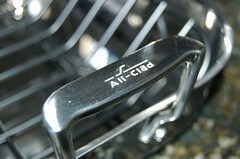 All-Clad has been making fully-clad stainless steel cookware for more than 20 years. As the manufacturer continues to expand it’s cookware lines a frequently asked question is what’s the difference between All-Clad d3 vs. d5? What are the essential knives for my kitchen? 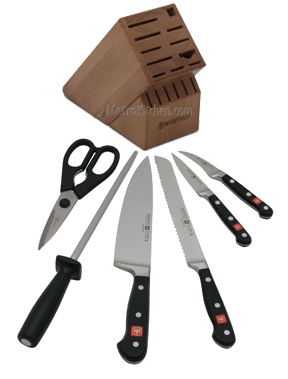 When it comes to kitchen knives, a few are absolutely essential for meal preparation. This guide will help you find the right knives and cutlery for your kitchen. While there are plenty of different types of kitchen knives for different uses, the most important ones are a chef’s or cook’s knife, a paring knife, a carving or slicing knife, and a bread knife. Also, these aren’t technically knives, but a pair of quality kitchen shears and sharpening steel are both equally essential kitchen tools that are worth considering. [Read more…] about What are the essential knives for my kitchen? As the holidays draw near all the cooking that’s about to happen in your kitchen is top of mind. Lots of loved ones will be gathered to feast upon the tasty delights you prepare for them. While it may be a labor of love for you, it never hurts to double check to be sure you have everything you need to ensure all goes as planned. Roasters: Our Guide to Roasting Pans! [Read more…] about Roasters: Our Guide to Roasting Pans! Why Does Everyone Want a Vitamix? A Vitamix blender is more than just an average mixer. Vitamix machines are renowned as the world’s most versatile and durable blenders. What sets them apart from the competition? First, Vitamix blenders are capable of preparing anything from frozen dessert to hot soup. When it comes to processing ingredients, they can chop, blend, cream, puree, pulverize and more! The blade used in each Vitamix machine is made from hardened stainless steel, so they’re long-lasting and durable. 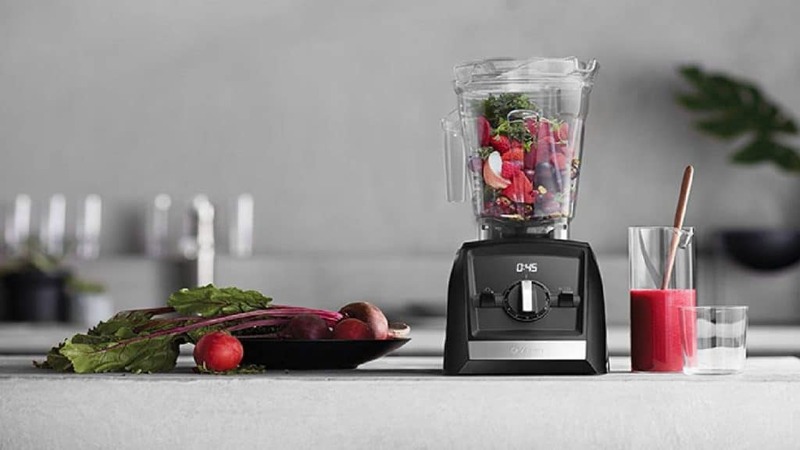 Thanks to these super sharp blades and their powerful motors, they can make whole foods into liquids and blend every ingredient while retaining all of the nutrients. [Read more…] about Why Does Everyone Want a Vitamix?